There is an emergency scenario in almost all parts of our world: Fires, earthquakes, hurricanes… Some are more common than others, but we all live with the thought of one of those potential dangerous situations. So much so, that there are now even TV Shows about people, who prepare almost full time for emergencies, like Nat Geo’s latest hit ‘Doomsday Preppers‘. While they might take things to the extreme, we all know, that we need to be prepared in case of a situation, where food and water are not easy to come by, or evacuation is mandatory. One of the worst things about emergency situations is, that they are unpredictable. They can hit from one second to the next. Even if there is some warning, like in the case of a wild fire closing in or a weather related disaster, such as a hurricane or tornado, there may be little time to prepare. That is why it is so important to have a plan. For us dog people, we have to plan for our canine family members as well. Catastrophes like Hurricane Katrina showed us, how essential it is, to even have crates for the dogs. Most shelters will not allow dogs, unless they are crated. And that is yet another example, of why it is so important to crate train your dog. Let’s start with the obvious: food and water. Most organizations recommend a 3 day supply. Personally, I like to have enough for two weeks. Dogs need about 1.5 ounces of water per pound body weight, when they are relaxed. Be generous though. When dogs are stressed (which is likely in an emergency scenario) or active, they start panting and their need for water increases. When you store dry food, make sure, it is in a safe air tight container, to avoid any water getting in and spoil it. Change it every once in a while, so it doesn’t expire. Use the same brand you normally feed. You don’t want to change your dog’s food in an emergency situation and risk diarrhea, when you might be short on medication, veterinary access or water. If you feed raw food, you might want to think about a high quality kibble to store for emergency situations, since freezers may not be an option. If your dog food is in cans, don’t forget the can opener! Paperwork may be more important than you think. Keep a copy of your dog’s current license, vaccination records, medical data (allergies, medication) and other information, such as name, date of birth, regular dog food, temperament (e.g. fearful of strangers) – and don’t forget a list with emergency addresses, emergency clinic and your regular veterinary. If you have to evacuate to a shelter, they will want to see your dog’s records – and if you have to leave your dog behind, you can tack a copy of all these information on your door for the rescue personnel. I recommend to have these records laminated. In case you do have to leave your dog behind, keep them safely contained inside with enough water for a couple of days and some food. Next: Medical supplies. Prepare a K9 first aid kit – it is essential to have, not only in emergency situations. I even keep one in my car. 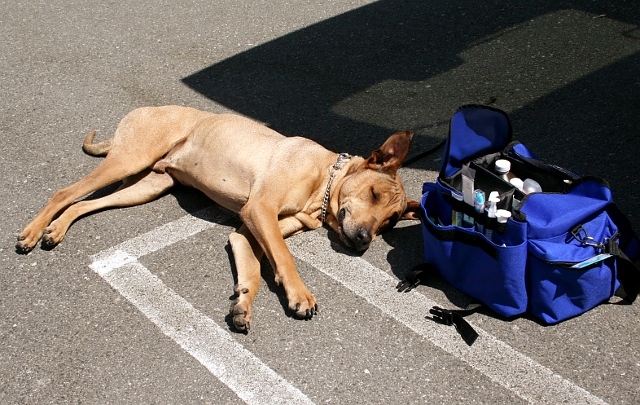 A lot that goes into K9 first aid kit can also be used for humans – two flies with one strike. Additionally, I always store a couple of cans of pumpkin, no sugar or any other ingredients, the regular store-bought kind. It helps with diarrhea and constipation and most dogs like it enough to eat it with their regular food. 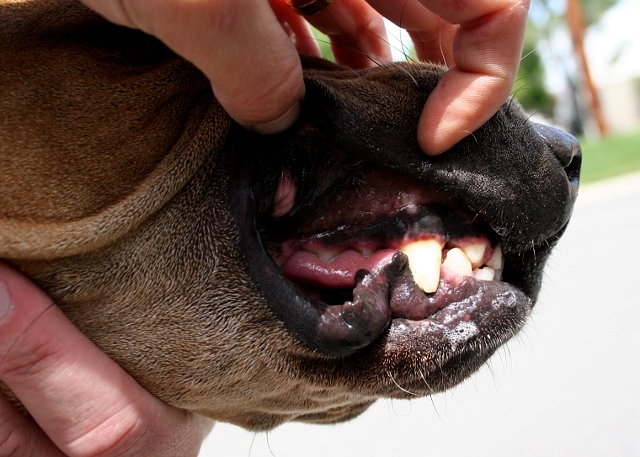 Make sure, you have an adequate amount of your dog’s medication, if needed. Talk to your veterinary clinic about getting a bigger refill, so you can store some in an airtight container. They might also be able to recommend supplies for the first aid kit. You will also need every day items, such as your dog bed, water and food bowls and pick up bags. I include some favorite toys to play and some chew toys like a Kong. Store everything in a carton box, so you can just grab it and go. 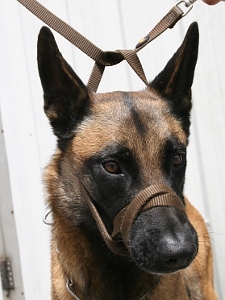 An additional set of leashes is also useful. Once you have everything organized, you need to make a list of nearby shelters, including motels, who are pet friendly. Write down the number of your local shelter – they may have more information in case of emergency. Make sure your dog’s tags are up to date and include your phone number and address. All these steps don’t take much time. Dedicate a Sunday afternoon or Saturday morning to create an emergency preparedness kit and a plan! Enlist the help of your kids to put it together, so they are more aware, too. FEMA has some interesting and useful articles on their website, here is one specifically for pet owners: FEMA – Information for Pet Owners.